This company is committed to providing its customers with effective and environmentally conscious pest control services. 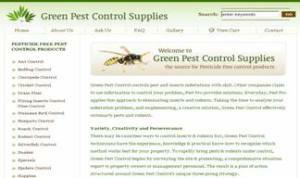 It offers the latest in green pest control technologies and products. The New York web design by Bitochon features an Ecommerce store that enables the merchant to upload photos and information about its products, accept payment for orders via credit card, print reports and ship orders.